NEW FIGURES ON the number of Irish students in receipt of grants has shown that students from Donegal are nearly twice as likely to receive a grant than their Dublin counterparts. It has also been found that the majority of Ireland’s university places are taken by students from wealthier homes. The breakdown of grant distribution, the first of its kind, has been put together by the Higher Education Authority (HEA) and found that overall in Ireland 46% of new entrants to higher education surveyed were in receipt of a student grant. The research looks at students entering higher education for the academic year of 2013/ 14. Grant eligibility is generally determined based on a student’s income or their parent’s income, making it a strong barometer of the social class of individuals attending university. 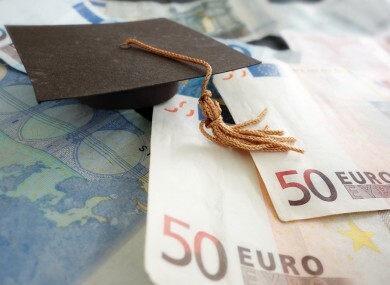 There are seven separate categories that students are able to apply for grants under – with those coming from households earning somewhere between around €22,000 and €64,700 eligible to apply. The fact that the majority of university places go to students from wealthier homes is borne out in the disparity between students attending institutes of technology and those attending universities when it comes to how many receive the grant, with 52% and 32% receiving them respectively. The majority of the 68% of students attending university who are not in receipt of a grant come from households earning above the €64,700 threshold. Where are the most grants given out? Around the country, Donegal was found to be the place with the highest percentage of individuals receiving grants, with 67% of students benefitting. Dublin was the county with the lowest percentage of grants, with only 35% of students in receipt. The higher education institute with the highest percentage of students receiving grants was Letterkenny Institute of Technology on 71%, while Trinity College Dublin had the lowest percentage of students receiving them, on 24%. Email “Donegal students almost twice as likely to receive grant money than those from Dublin”. Feedback on “Donegal students almost twice as likely to receive grant money than those from Dublin”.